Metro's new tool will make mapping economic data easier, helping city planners and economists understand each other's goals. The local regional government Metro launched its Economic Value Atlas Monday Feb. 11, 2019. The online mapping tool that brings together dozens of databases to give a picture of where the wealth is, where the jobs are, and where the workers are. Just as an atlas has a different map of the same thing on every page — political, geological, population, etc. 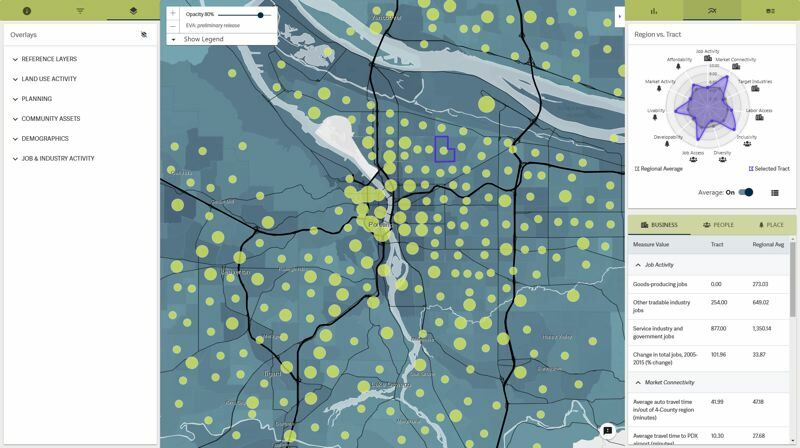 — so the map of the Portland metro area changes with the click of a button. And there are a lot of buttons. One of the key creators of the tool is Jeff Raker, Metro's Economic Development Planner in the Planning & Development Department. 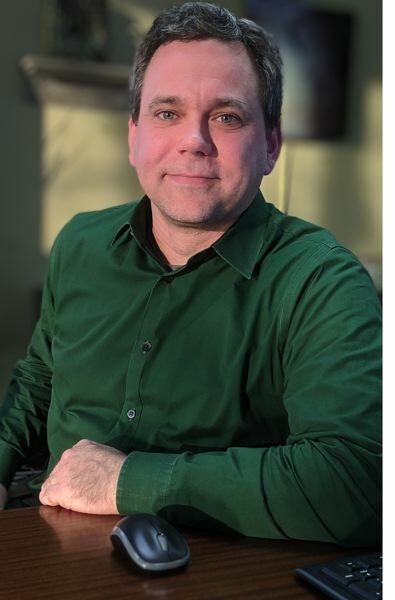 He told the Business Tribune that two separate worlds have been coming together for a while now, but the EVA will speed up the process and give the Portland area an edge. Economic development (luring companies to Portland, or growing new ones) is a key part of government. Urban planning is a big part of what Metro does, but the two haven't been able to mesh really well until the EVA. Raker's been working on it for three years. He previously did something similar in the Puget Sound area, where private and public sectors worked well together. "A lot of folks who come in from planning have a good understanding of how to align transportation and land use for community benefit, but with less of an understanding of what that means in terms of growing and attracting businesses in the area. This project is a nod toward that effort." Much has been done to compare Portland to other cities or Metropolitan Statistical Areas like Denver and Austin. "This tool allows Portland to compare ourselves to ourselves, and we do this at the census tract level (small pockets of population, usually the size of a neighborhood)." Economic development organizations, the Port of Portland, the Brookings Institute, some state office, counties and cities worked on it, as did some private sector firms. One big trend: only 3 percent of growth in Oregon comes from recruiting outside firms. 14 percent comes from expansions from another area, and the vast majority comes from local growth: startups going from small to medium-sized. The result was a need to feel out the business climate in different areas and build on it. A user clicks on categories and the more of something there is, the darker it is shaded in on the map. The tool allows anyone to play the economic development game, or pretend to be an industrial site selector. Click on say, "Low-skilled workers within a 30-minute commute" and "large areas of shovel ready industrial land" and up pops Troutdale — exactly where FedEx and Amazon have their warehouses. The data is stackable, meaning you can combine lots of data visually. For example, a company that wants to move goods in and out of the city quickly can search for that. The database works from Metro's travel model, that shows how long it takes automobiles to get to freeways. Much of the data comes from the U.S. Census as well as local government. The Brookings Institution is a big partner in the modeling, and provides a lot of data. Its economists factor in things like automation. For instance, does a factory need to be near population centers if it is mainly robots? Data centers, spread through the Gorge and Central Oregon, are examples of that. Raker says the tool could be used as part of Metro's housing measure, or the 2020 Transportation measure, "to give some context around proposed corridors and other investment....If we make an investment in transportation or a change in land use policy, can we correlate what we see of changes to that policy, in terms of how we're creating lift in the community?" Metro distributes some federal money to transportation projects, and now they will be able to incorporate new measures for economic development. The hard work was coming up with the values, and getting indicators that were robust and relative to those values. Currently the EVA is in beta — not everything is fully public-facing — and it's in its 30-hour version. This means only professionals with clear questions and a lot of billable hours will get much out of it. However, by July 30-minute and a 30-second versions are coming, for those who just need a quick search. It will be replicated on a two-year cycle. Business site selectors usually pay to use CoStar, which is a real estate guide. Metro's EVA uses mostly public data. (They want snapshot data, rather than constant dynamic data, like RMLS house prices) which makes for better comparisons or "stacking". EVA's data is not like Google's Sidewalk Labs, where cell phone data is refreshed every few seconds. This is slower moving data. "Livability" is measured by walkability and access to services. The tool borrows criteria from Greater Portland Inc's three categories — Business, People, Place — and uses 12 shared economic values. A company might want to poach skilled workers from competitors, so it would want to cluster near them. There's a map for that. Other data is stunning: clicking on where labor has access to low skilled workers, it's a doughnut, meaning not many live in the central core any more. "This highlights the need for more affordable living," says Raker. "If you're an advocate for economic justice you can bring up areas with high poverty, and income gap is high and where median income is falling," says Raker. He pulls up those maps and there's tract in "The Numbers" (a couple of miles east of I-205 near Powell Boulevard) that fits the bill: It has 44.6 percent poverty and the median income is down 38.34 percent. Raker says the EVA will be used mostly by Metro and economic development professionals. But the goal is transparency, for the eyes of anyone. "You start to see some interesting stories about the economy. The idea is to have a database discussion about our economy, a little bit more informed with real data rather than anecdotal considerations."